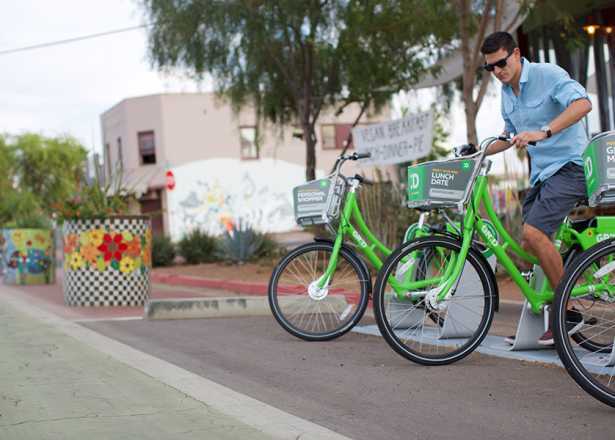 Avowed suburbanite goes green—‘acid green’—to tour Phoenix’s cultural gems on two wheels. Somehow, I have morphed into a card-carrying suburbanite, complete with a yoga-pants wardrobe, an SUV and garage full of Weed Eaters and hedge trimmers. Longing to reclaim my inner urbanista, I bamboozled a pal into exploring the downtown Phoenix arts and cultural district with me. On bikes. More specifically, using Grid Bike Share, those acid-green bikes we’d been seeing parked at hubs around the city’s central core. On a sunny Saturday morning we started our car-less urban adventure by parking at the city’s free Park-and-Ride facility at Central Avenue and Camelback Road, next to the light-rail station. We decided it would be easier than circling around looking for parking near our chosen bike hub. Before we whooshed to the bikes, we caffeinated ourselves across the street from the parking lot at First Draft Book Bar, a coffee and wine/beer bar located inside Changing Hands Bookstore, one of Phoenix most beloved indie book shops. 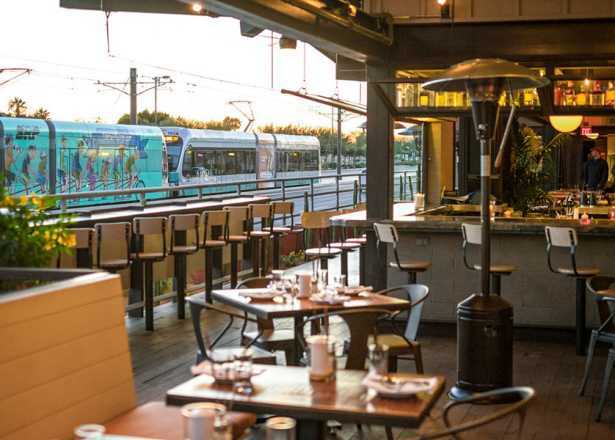 The bar is a laid-back kind of place that encourages browsing books with a cappuccino in hand. Synapses firing and reflexes revved, we took the light rail south to the Roosevelt Street station, where we found a Grid Bike Share hub with a dozen or so bikes at our disposal. My friend had downloaded a Grid Bike app to her smartphone, and I had set up my account online at home, so it was a matter of entering account and pin numbers to spring loose two bikes from the racks. Each bikes comes equipped with a lock, a bell and a basket (in case there was any shopping during our excursion); you have to supply your own helmet. We heeded advice to put the bikes “on hold” when we locked up at a stop so we wouldn’t have to restart the rental process each time. We chose to use bike paths on 3rd and 5th Avenues to get to our destinations, as opposed to busier Central Avenue. Our first stop was the Japanese Friendship Garden, a 3.5-acre Zen oasis adjacent to grassy Hance Park. Opened in 2002, the park is meant to foster understanding of Japanese culture through events like tea ceremonies and ikebana workshops. We meandered the shady path that circles a pond, stopping to feed slow-moving koi and admire sculpture. A quick spin through Hance Park took us next door to the Irish Cultural Center, where three freestanding stone buildings replicate a 12th-century Norman castle, a cottage and a barn. We chose to wander around on our own, but for a small fee we could have taken a guided tour of the grounds and museum exhibits. This is a great place to learn about Ireland’s culture or (if you’re Irish) trace your ancestry. On St. Patrick’s Day, there’s live music, dancing, food and beer. Also adjacent to Hance Park is the Burton Barr Central Library, our next stop. As an architecture geek, I love this iconic, design-award-winning, modernist building that rises above Central Avenue like a cliff. Completed in 1995, it was designed by two leading Arizona architects, Will Bruder and Wendell Burnette, who have gone on to do other landmark projects. My favorite element? The vast fifth floor reading room, where skylights perfectly illuminate tapering columns during the summer solstice, which the library hosts as an annual viewing event. After doing a bit of lunchtime people-watching through the window, we hopped on our bikes and headed north for more culture. At Phoenix Art Museum, we spent a few hours checking out the changing exhibits, as well as the museum’s permanent collections. We were mesmerized by the museum’s impressive fashion collection, which includes pieces by the likes of Fortuny, Balenciaga, Yves Saint Laurent and Adrian, plus special exhibits put together by the museum’s noted fashion curator, Denita Sewell. We also enjoyed the photography collection. We spent most of our remaining time in the museum’s “Home: Native People in the Southwest” exhibit, which traces the cultural traditions of most of the Southwest’s tribes (think Navajo textiles, Hopi Katsinas, Zuni jewelry). There was more to see, but the museum was closing, and we were getting sensory overload from our day of urban exploration. 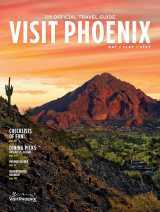 We vowed to come back—to the Heard and to downtown Phoenix. We locked up our bikes at the Vernon and Central avenues Grid Bike hub and hopped the light rail at the adjacent station to get to the car. As I headed back to my suburban lifestyle, I contemplated trading in gardening tools and Lululemons for a bike and a transit pass. It’s a tempting proposition. 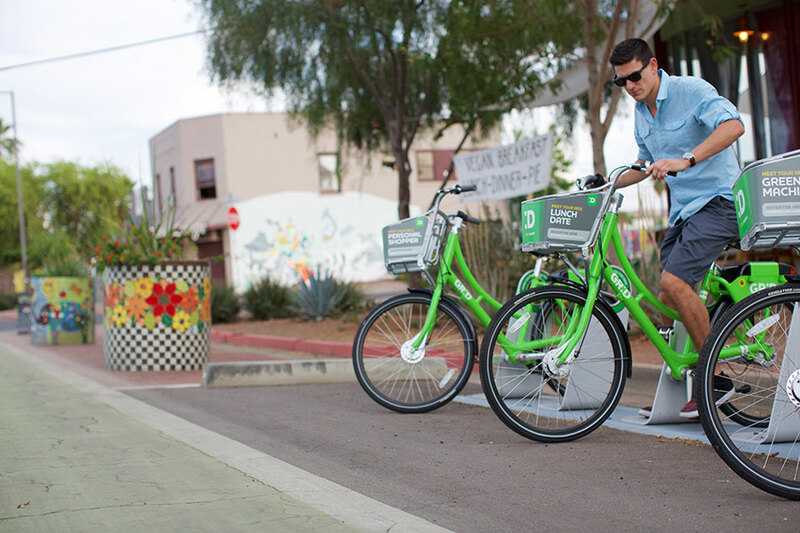 For more details on using Grid Bikes in central Phoenix, visit gridbikes.com.